This movie is excellent and has a lot of quotable lines. Kurt Russell does a really great job as Eldon Perry. His character is interesting. The action scenes are well-filmed. The movie is a cross between gritty and glossy like Training Day (2001). Narc (2003) is grittier by comparison. Kurt's and Ving Rhames dialogue is so funny it's brilliant. Example: Eldon: "WE BUILT THIS TOWN... WITH BULLETS!" and this classic: "I know all the deep dark secrets." 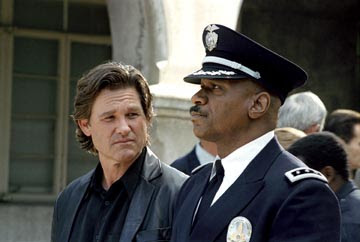 Ving plays a cop named Arthur Holland. When he explains his back story with his church, this line made me laugh: "My badge doesn't seem to glow anymore." The speech at the end by Kurt is convincing. 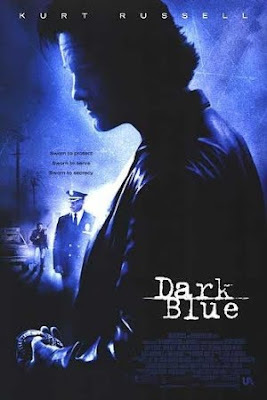 Dark Blue is definitely worth watching.